This howto will show you how to build a basic multi-master MySQL cluster (actually, a Percona XtraDB cluster) with a load balancer in front of it. OS: Ubuntu 12.04 LTS (precise pangolin). Database: Percona XtraDB Cluster. Percona XtraDB is a higher-performance, backwards-compatible drop-in replacement version of the InnoDB storage engine for MySQL. The Percona XtraDB Cluster is the Percona Server setup with the Galera multi-master cluster libraries built in. 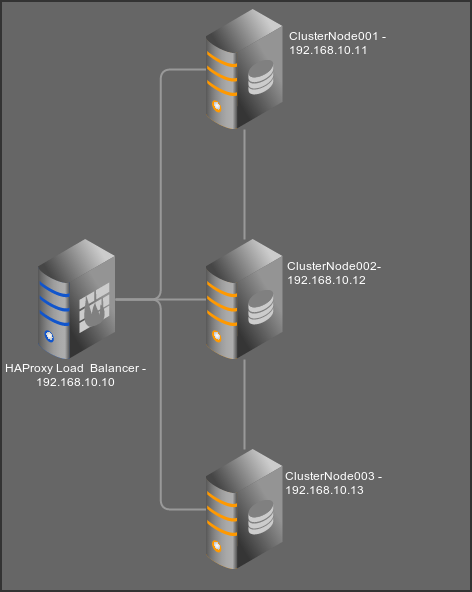 Load balancer: HAproxy. HAProxy is a very high performance TCP/HTTP load balancer. 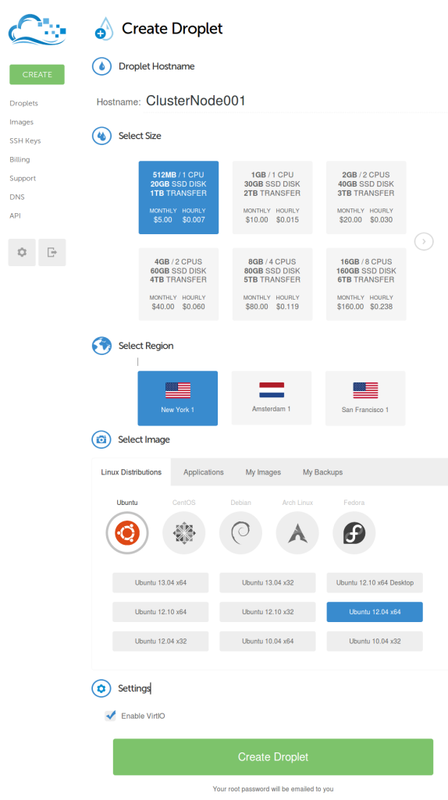 I used DigitalOcean for this tutorial, but use whomever you like. Log in to each of your database servers and set up Percona XtraDB Cluster. It will ask for a MySQL root password during each install. I kept them the same over the nodes. Choose a machine that will create the initial cluster. Forming an initial cluster is called bootstrapping the cluster. (Create &) Edit /etc/mysql/my.cnf on the bootstrap node. wsrep stands for WriteSet REPlication, BTW. wsrep is a project that aims to develop a generic database replication plugin interface, and Galera is a specific wsrep provider. Notice line 10, where the wsrep_cluster_address (gcomm://) address is empty. This will tell this node to bootstrap itself (create a new cluster) on startup. We will comment line 10 and uncomment line 13 later when the rest of the cluster is ready. You’ll notice that line 13 specifies all the other node addresses in the cluster – it is stricly speaking only necessary to specify one other node, but listing all of them is noted as a best practice in the Percona documentation. wsrep_cluster_name is the unique name of your cluster. It should be identical on all nodes that form part of the same cluster. wsrep_sst_method specifies the way a State Snapshot Transfer (SST) is taken. Cluster nodes are kept in sync through SSTs and ISTs (Incremental State Transfer). An SST is a full data copy from a donor node to a joining node, and an IST a way for a joining node to catch up through a transfer of partial state snapshots (writesets) from the donor node’s writeset cache. xtrabackup – uses Percona XtraBackup to take an SST. It’s useful because it doesn’t lock the donor database during an SST. We need to set up an SST user for xtrabackup, hence the values in wsrep_sst_auth. rsync – uses rsync to transfer the relevant info. Donor node is locked as READ-ONLY during transfers. mysqldump – uses mysqldump to take an SST. Also READ-ONLY locks the database during transfers. Needs a wsrep_sst_auth user, and that user needs MySQL root privileges. You can also use a custom script to take an SST, but for our purposes we will be using xtrabackup. If all went well it should start up without a hitch. We now need to add the SST user as identified in the wsrep_sst_auth directive. Looking good – this output shows a successfully bootstrapped node. You can use the MySQL root user for SSTs, but it’s not recommended. Time to configure the other nodes and get them to join the cluster. This cnf file differs from the bootstrap node’s cnf file in that line 10 (wsrep_cluster_address) specifies the cluster addresses. Line 26 has to be set to the node’s own IP address. Repeat for the last node, changing line 25 and 26 to reflect the correct address. * Checking for corrupt, not cleanly closed, and upgrade needing tables. 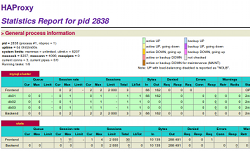 That SST in progress line tells you that it connected to the server and is receiving an SST. Once all the nodes are connected you can stop the bootstrap node’s MySQL service, comment line 10 in it’s my.cnf, and uncomment line 13 in it. Restart the MySQL service on it after saving the cnf file. Not fixing the wsrep_cluster_address directive on the bootstrap node will make it re-bootstrap itself on restart. All three nodes should now be running happily connected to each other. Let’s test some things. Percona installs a script called clustercheck in /usr/bin/clustercheck. It’s a simple script that checks a node’s MySQL wsrep_local_state variable value and outputs HTTP 200 if the node is in sync, and HTTP 503 if it isn’t (or if it couldn’t connect). Just change the default values there if you want to change the clustercheck user. You don’t have to repeat user addition on the other nodes as it will propagate through the cluster by itself. Just remember to edit the clustercheck scripts on the other nodes if you are not using the default username and password. Percona XtraDB Cluster Node is synced. All our tests check out. We are going to set up the load balancer soon. But we need to find a way to make the load balancer aware that a node has gone out of sync. That’s why the clustercheck script exists. To expose the clustercheck script we will be using xinetd. This is a daemon that listens on a port you specify, running a specific command once you connect to that port, and returning the output of the command to you. As you can see, it specifies that xinetd should listen on port 9200, and return the output of /usr/bin/clustercheck if you connect to port 9200. Lather, rinse, repeat for the other database nodes. Log into your server that you want to use for load balancing, 192.168.10.10 in this example. The interesting detail to look at are lines 28-30, where HAProxy’s httpchk functionality is used to check for an HTTP 200 status on port 9200 of the cluster nodes – thus running the clustercheck script via xinetd, and taking a node out of circulation while it is not synced. It’s a better way to manage nodes than just checking if port 3306 is open. You will probably get a warning about <debug> mode incompatible with <quiet> and <daemon>. Keeping <debug> only. You can remove this by editing /etc/haproxy/haproxy.cfg and removing the debug option and enabling the quiet and daemon options (lines 7 – 9). I found it useful to mess around in debug mode at first, though. I had a problem the first time I set this up. I got Error Code: 1129 Host ‘192.168.10.10’ is blocked because of many connection errors; unblock with ‘mysqladmin flush-hosts’ after a while when connected to my cluster. I’m still not sure why it happened, or that my actions cured it; I do know it hasn’t happened again after adding the option tcpka (line 26: enabling TCP Keep Alive) to the haproxy.cfg file. Not understanding it feels a bit like magic. Hopefully someone more clued up can weigh in with some ideas. The MySQL manual notes that it happens after a certain amount of interrupted connection requests, hence my trying to keep the connections alive. Since the setting does nothing much for security it may make sense to set the max_connect_errors value in your MySQL configuration to some insanely high value. Now that HAProxy is running (and you are hopefully not dealing with unexpected results) you should be able to connect through MySQL to your load balancer, and it should be round-robining the requests to your cluster nodes. Security can be improved a bit – I would suggest at least locking down xinetd to only allow connections from your load balancer (look at line 12 in /etc/xinetd.d/mysqlchk – the directive takes += as operator so you can list multiple IPs below each other). You can also close ports on the cluster nodes to only allow MySQL and SSH access. The MySQL cluster needs 3306, 4444, 4567, and 4568 open, and SSH is typically running on port 22.
should do to open specific ports. to the /etc/haproxy/haproxy.cfg file. Restart HAProxy, and browse port 8080 on your load balancer’s address. Remember to change Username and Password to values that you like for HTTP authentication. Round-robining between the cluster nodes is an OK, but not great, strategy for the load balancer. If two nodes receive conflicting writes rollbacks can occur. It would be better to only write to a specific node at a time, failing to another node only if the active node goes offline.